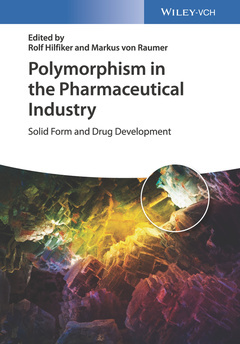 "Polymorphism in the Pharmaceutical Industry - Solid Form and Drug Development" highlights the relevance of polymorphism in modern pharmaceutical chemistry, with a focus on quality by design (QbD) concepts. It covers all important issues by way of case studies, ranging from properties and crystallization, via thermodynamics, analytics and theoretical modelling right up to patent issues. As such, the book underscores the importance of solid-state chemistry within chemical and pharmaceutical development. It emphasizes why solid-state issues are important, the approaches needed to avoid problems and the opportunities offered by solid-state properties. The authors include true polymorphs as well as solvates and hydrates, while providing information on physicochemical properties, crystallization thermodynamics, quantum-mechanical modelling, and up-scaling. Important analytical tools to characterize solid-state forms and to quantify mixtures are summarized, and case studies on solid-state development processes in industry are also provided. Written by acknowledged experts in the field, this is a high-quality reference for researchers, project managers and quality assurance managers in pharmaceutical, agrochemical and fine chemical companies as well as for academics and newcomers to organic solid-state chemistry. Rolf Hilfiker is vice president and head of the department Solid-State Development at Solvias AG in Kaiseraugst, Switzerland. He obtained his PhD in physical chemistry from Basel University (Switzerland) and then did postdoctoral work at Stony Brook University (New York). He returned to Basel University as a research fellow and then moved to Ciba-Geigy (now Novartis) in Basel. In 1997 he became head of the Stability & Kinetics group at Novartis. In 1999 he participated in a management buyout to form Solvias AG. He has taught physical chemistry in New York and Basel, as well as numerous courses in solid-state development in Europe, Asia, and the US. Markus von Raumer is director and group leader of Preformulation and Preclinical Galenics at Idorsia Pharmaceuticals Ltd. in Allschwil, Switzerland. He obtained his PhD in physical chemistry from the University of Fribourg (Switzerland) and then did postdoctoral work in the field of mass spectrometry at the University of Warwick (UK). In 1997 he became head of laboratory of Physical Chemistry at Novartis in Basel, Switzerland. Two years later he moved to Solvias AG in Basel where he was project manager for Solid-State Development until 2008. He then joined Actelion Pharmaceuticals Ltd. in Allschwil where he built up and led the Material Science lab until 2017.